School let out early for a winter storm. Scotty Weems and his friends Jason and Pete took to opportunity to stay after school and spend a few hours working on Jason’s shop project. No one realized this would turn into the storm of the century. Before the end of the day, the seven students knew no one was coming for them. 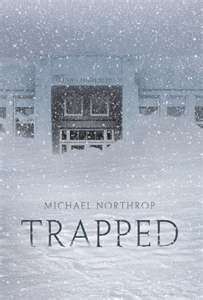 How dangerous can it be trapped together in a high school during a winter storm? That’s what I asked myself. The kids had shelter, food, water, bathrooms, blanket raided from the nurse’s office. What could happen? But Michael Northrop creates a scenario which only escalates, keeping readers on the edge of their seat. It’s a little hard to buy a storm that would dump 18 feet of snow on the ground in a week, but I suppose it could happen. And if it did, these dangers would be very real. Aimed at high schoolers and about high schoolers, Mr. Northrop nevertheless keeps his tale within fair boundaries. Sure, there’s some bathroom humor, a lot about zits and hormones and a general disregard for anyone over thirty. Kid’s stuff. And the language is spot-on teenage dialogue complete with biting, sometimes suggestive language, but nothing downright objectionable. Instead, Northrop focuses on suspense and survival. I would have liked to see a greater depth to the characters. We do get to know each personality–how can you not after a week together?–but they feel stereotypical. Such a long-term, life-threatening situation provides opportunity for much greater depth. I hoped to learn more about their backgrounds, their families, to come to understand their feelings (other than fear and lust), to find out what makes them tick. But their interaction remains very superficial. Also, the story concludes with only the kids’ outcome. We never learn what happens to the ones they are worried about. I felt a little let down at the narrow ending. Yet Trapped offers readers an emotional, engaging story. I hardly put it down. Kindle available in title link.